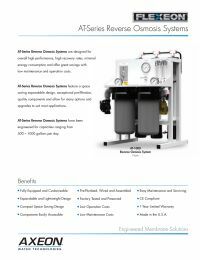 The Flexeon AT-500 Commercial RO System is made in the USA with high quality components. The Flexeon 200029 is pre-plumbed, wired and assembled on a convenient powder coated aluminum frame. Designed for easy maintenance and servicing. Available in three different packages to suit your specific needs, the AT-500 also gives the benefit of low operation and maintenance costs. Ships LTL, pallet approx 38x31x36 @ 120 lbs approx. 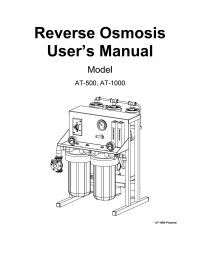 Formerly known as Titan 500 A-series commercial reverse osmosis system by RO Ultratec and Crystal Quest CQE-CO-02024 commercial reverse osmosis system.